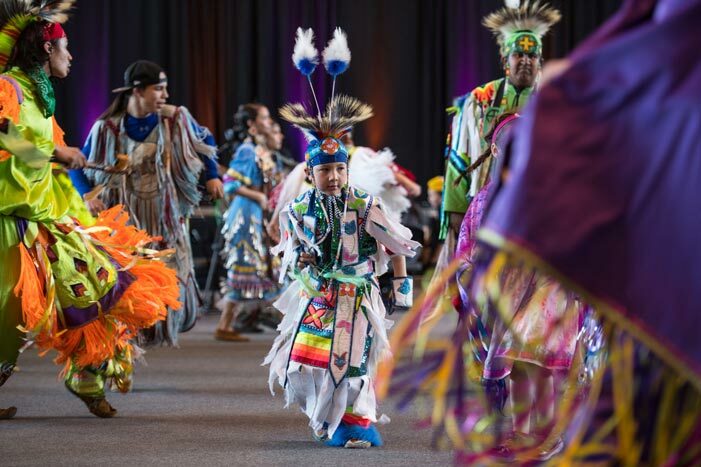 On Thursday April 5, the Mi’kmaq-Wolastoqey Centre at the University of New Brunswick will host the UNB Powwow at on the university’s Fredericton campus. The annual UNB Powwow is a celebration of Mi’kmaq, Wolastoqey and Passamaquoddy languages, teachings, traditions, ceremonies, worldviews, knowledge systems and philosophies. The public is invited to attend this free event – the fourth annual – at the Richard J. CURRIE CENTER from 11 a.m. to 4 p.m.
"The powwow is a gathering of people to celebrate life, songs, dances, languages and traditions,” says David Perley, director of the Mi’kmaq-Wolastoqey Centre. Muskrat Singers will serve as host drum at the UNB Powwow while Spirit Bear and Hey Cuzzins will appear as guest drum groups. Head male and female dancers this year will be Bronson Acquin-Manisodza and Amanda Reid while junior head male and female dancers will be Wambi Martinez and Montana Bear. At 11 a.m., the powwow will commence. The grand entry will feature elders and traditional dancers in full ceremonial regalia. The grand exit at 4 p.m. will bring the UNB Powwow to a close. The public is encouraged to visit the many First Nation vendors that will be selling traditional art, crafts, and food. This event will be videotaped and photographed for promotional purposes. For those unable to attend, the event will be livestreamed on the Mi’kmaq-Wolastoqey Centre website.